Genetic studies show that chimpanzees and humans share a common ancestor and 98% of genes. Because we are so similar chimpanzees get many infectious diseases that humans get. Chimps belong to the group of greater apes along with gorillas, bonobos and orangutans. They are stronger than humans because of the way neurons activate their muscles they have less control over how much muscle to use. Jane Goodall is a scientist who spent almost 30 years studying chimps in the wild in Gombe National Park in Tanzania. Human skull on the left and a chimpanzee skull on the right. Scientific Name: Pan troglodytes. Pan for the Greek word for “all, whole, all inclusive, every”. Troglodytes for the Greek word meaning “cave-dweller, cave-man”. Common Name: Chimpanzee. From a Bantu language of Angola (compare Tshiluba kivili-chimpenze “ape”). Chimpanzees are protected throughout its range by national and international laws. They are listed on Appendix I of the Convention on International Trade of Endangered Species of Fauna and Flora (CITES). The convention states that It is illegal to kill, capture or trade live chimpanzees or their parts. They are also listed under Class A of the African Convention on the Conservation of Nature and Natural Resources. The Common Chimpanzee (Pan troglodytes) inhabits the forests of Central and West Africa. Western Chimpanzee (Pan troglodytes verus) inhabits the region of Western Africa from Senegal to Ghana. They live at a maximum altitude of 5,272 feet (1,607 meters). Nigeria-Cameroon Chimpanzee (Pan troglodytes ellioti) has the smallest distribution of all subspecies, it is found at a maximum altitude of 6,561 feet (2,000 meters) north of the Sanaga River in Nigeria and Cameroon. Central Chimpanzee (Pan troglodytes troglodytes) is found from Cameroon, south of the Sanaga River, to the Congo River in the Democratic Republic of Congo. They live at a maximum altitude of 2,434 feet (742 meters). Eastern Chimpanzee (Pan troglodytes scheweinfurthii) is distributed through the southeast Central African Republic and Democratic Republic of Congo to Rwanda, Burundi, western Tanzania and Western Uganda. They live at a maximum altitude of 9,153 feet (2,790 meters). Their distribution is becoming increasingly fragmented due to loss and degradation of habitat. 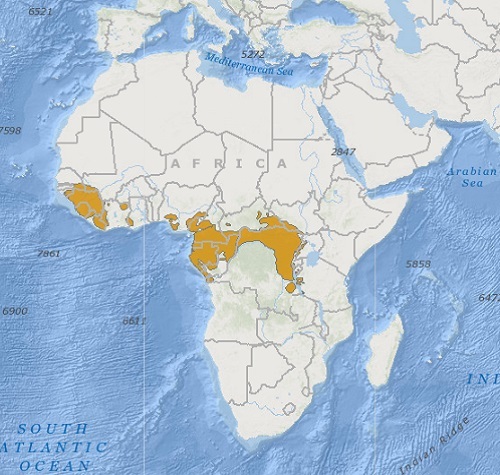 Chimpanzee distribution map. Map adapted from the International Union for the Conservation of Nature (IUCN). According to the IUCN the chimpanzee population decrease is expected to exceed 50% over a 25 year period from 1975 to 2050. The estimated population as of 2003 was 172,700 to 299,700 individuals. Threats to its population include poaching for bushmeat, loss of habitat and degradation due to human activity, infectious diseases and virus, pollution, political instability that prevent law enforcement and lack of resources. Chimpanzees are found in primary and secondary forests, swamp forests, savanna woodlands, grasslands, mountain forest, tropical rainforest and farmland. They are both terrestrial and arboreal. Chimps have hair all over their body except for their face, hands and feet. Their hair can be black or brown. Baby chimps have pink skin under their dark hair which turns dark as they age. Unlike other primates chimpanzees do not have a tail. They have opposable thumbs just like humans, it helps them grab objects. Their thumbs are shorter allowing them to climb trees without interference from the thumb. Their arms are long, about 1.5 times the height of an individual. This helps them walk on all fours with their head erect. They are social animals and live in aggregations of an average of 35 members. The largest known community has 150 members. Usually a male chimpanzee stays in the community where he was born. Females move to other groups when they become adults. They are proficient tool users and are one of the few animals to use them. They shape and use branches from trees to extract termites and honey, they also use stones to crack nuts. They use chewed up leaves like a sponge to sop up water to drink. Chimps are diurnal animals, active during the day. At night they sleep on trees making a fresh nest every day. They spend their days looking for food, playing, resting and grooming each other. Chimpanzees normally walk on all fours but they can also stand and walk upright. They are known as knuckle walkers because they walk on the knuckles of their hands. They move from tree to tree by swinging from branch to branch. Like humans, chimps can communicate with facial expressions, sounds and gesture. Female Chimpanzees reach sexual maturity at age 13 while males at 16. Gestation lasts 7.5 months and females give birth at any time of the year to usually a single infant. Infants lactate until they are about three years old and are carried by their mothers, piggyback style, until they are four. Chimpanzees are omnivorous and opportunistic feeders. They are the most carnivorous of all the great apes. Their diet is 50% fruits and the rest is composed of bark, vegetation, leaves, seeds, flowers, honey, mushrooms, eggs, insects and medium sized mammals. Chimps can live about 60 years in captivity however in the wild their life span decreases to an average of 45 years. 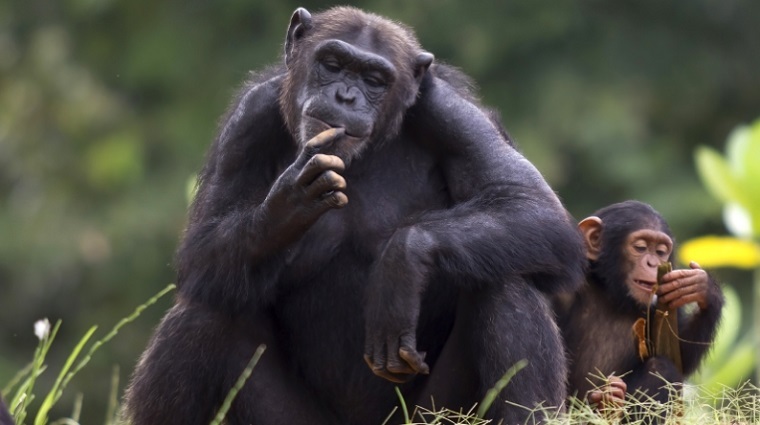 Smithsonian Magazine – Why are Chimpanzees Stronger Than Humans?